Security System Installers: Leave the Hard Work to Us! Even the most high-end security system is as good as worthless if it isn't installed properly. Fortunately, there's no need for you to carry out this potentially complex task yourself - just leave it to the experts at IDS! We supply and install a variety of different systems right across England and Wales, and more importantly, we've been doing it for more than two decades. Our experienced security system installers know how to get the job done quickly and efficiently, ensuring that everything is correctly set up and that there aren't any gaps in your security system. No matter what kind of security system you require, we at IDS are the people to call. We are capable of supplying and installing a range of state-of-the-art security solutions, including CCTV cameras, access control systems, fire/intruder alarms, and more. Get in touch now to speak with a member of the IDS Security team, or click here to see some of our existing clients. What's the Best Security System for Your Home? An effective intruder alarm system should be monitored 24/7 to ensure that your property is protected in the event of an attempted break-in. If you choose to take this route, you may wish to equip your home with a security alarm system that can also monitor for fires, medical emergencies, and other incidents; technology such as BT RedCare can ensure that the correct emergency services are contacted as soon as any of these situations arise. If you want to add an extra layer of security to prevent intruders from gaining access to your property, you may wish to implement an access control system. Numerous different interfaces are available, allowing an authorised individual to enter by typing in a code, presenting a key card, or even confirming their identity via state-of-the-art biometric technology (e.g. fingerprint readers). The good thing about using CCTV cameras to secure your property is the fact that you'll have video evidence of any crimes committed, which can help law enforcement officers to conduct investigations if necessary. 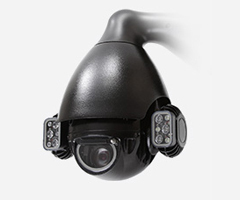 Many CCTV systems can be used alongside floodlights and other security features to further deter potential intruders. Of course, there's no need to select just one security system for your home - all of the above can be combined into a single robust solution, ensuring that your home and the people inside are comprehensively protected come what may. Click here to learn more about the home security solutions available from IDS, or contact us today to request a quotation for your property's security system. If you're looking for a vehicle barrier system that will allow you to efficiently restrict and manage vehicular access to your premises, we at IDS Security Systems can help. We are able to supply and install a wide range of vehicle barriers, including automated arm barriers, retractable bollards, and more. Our suppliers include such leading barrier specialists as CAME and FAAC. Their barrier solutions can be supplied with a variety of different access control systems; for example, you can manage access from a remote control station via radio, or you can allow drivers to gain access by entering a security code. Please visit our main Security Barriers page to learn more about the solutions we can provide, or contact us to request a quotation for your own vehicle barrier system. We at IDS are probably best known for our state-of-the-art security systems: CCTV cameras, intruder alarms, access control systems, and so forth. But did you know that we also specialise in the field of fire protection? Whether from intruders or from fire, we want to help you keep your premises completely safe. We work hard to keep up with the latest fire detection technologies, and like our security systems, all IDS fire protection installations are monitored 24/7, giving you total peace of mind. Click here for information about our fire protection options, or contact us now to request a quotation for your requirements.